भारत के जनसांख्यिकीय भविष्य के सम्बन्ध में सफ़ेद झूठों के आधार पर साम्प्रदायिक तनाव पैदा करने की कोशिश, Demographic Fear Mongering - The Creation of Communal Conflict by False Projections about the Demographic Future of India. The Creation of Communal Conflict by False Projections about the Demographic Future of India. 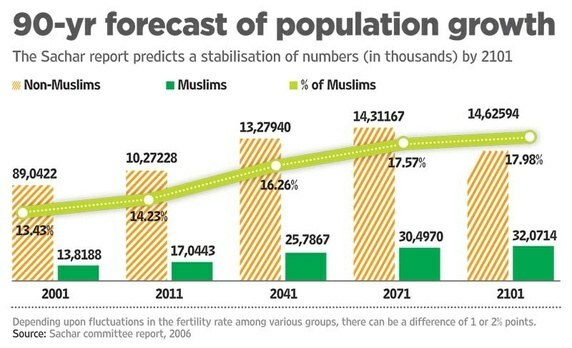 A concerted and sustained fear-mongering campaign is being carried on for some years now to propagate the ipression that Hindus are in danger of being outnumbered by Muslims and becoming a minority in India, because of higher fertility rate of Muslims relative to Hindus. This impression has been extensively propagated in public discourse in India.